Home » Sikh Martyrs » About 1984 | Operation Blue Star » Speech of 16th SEPT 1981 | Sant Bhindranwale Day Of Arrest (20.9.1981) | Bhindranwale At Mehta Before They Were Heading To Ludhiana Jail. Speech of 16th SEPT 1981 | Sant Bhindranwale Day Of Arrest (20.9.1981) | Bhindranwale At Mehta Before They Were Heading To Ludhiana Jail. This is the speech done by sant jarnail singh ji khalsa bhindranwale at mehta before they were heading to ludhiana jail. He alone is called a warrior, who is attached to the Lord’s Love in this age. A chair in the name of Lala Jagat Narain was established at Kurukshetra University in 1998.
on the 9th sant jis arrest warrant was issued by the panjab police on the 12th. On the morning of the 14th narkdhari DSP dhanna raam bhatti of ludhiana set sant jis buses worth 7lakh rupees (700,000rp) alight, singhs were beaten, maharajs gutke and senchiyan were all burnt in the fire at chando kalan. On the 16th at 4pm sant ji were given a receipt of the arrest warrant as the police came to arrest him. Heres the interesting part, this is where a pooran brahmgianis power comes into force. As the police had come to arrest sant ji, sant ji declared “i will give myself in for arrest on 20th september at mehta”. The police did not have the courage to handcuff sant ji and take him away. This is just one of many examples which highlights the true power of sant bhindranwales presence. Lala Jagat Narain, a Chopra Khatri and an Arya Samaji, was born at Wazirabad, District Gujranwala (now in Pakistan) in 1889. He graduated from D.A.V. College, Lahore in 1919, and joined the Law College, Lahore. He left his studies in 1920 at the call of Mahatma Gandhi to join the non-cooperation movement. He was sentenced in two and a half years imprisonment, in jail he acted as Lala Lajpat Rai’s Personal Secretary. In 1924 he became the editor of Bhai Parmanand’s Weekly Hindi Paper Akashvani. He participated in all the Satyagraha movement and was in jail for about nine years on different occasions. His wife was in jail for six months. His eldest son, Ramesh Chandra, was arrested during the Quit India movement. 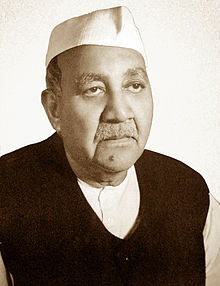 Lala Jagat Narain was President of the Lahore City Congress Committee for seven years, leader of the Congress Party in the Lahore Corporation, a member of the Punjab Provincial Congress Committee for more than thirty years and member of the All-India Congress Committee for about 30 years. Lala Jagat Narain, an Arya Samaji, was a prominent critic of Jarnail Singh Bhindranwale. "On that day in a great fury he [Bhindranwale] called upon someone to read aloud what Lala had said. There was quiet. 'Our turban has been torn from our heads,' he proclaimed. Then one of his followers asked, 'What are your orders?' Again in anger, he said 'Orders, you need orders! What orders? Are you blind?' Now you see he did not say anything. And they said it. 'O.K.' meaning thereby, we'll finish this man. So, then, 3-4 days later, Lala was coming from Ludhiana and they fired upon him." "Some son of his mother could stand it no longer and put him (the Lala) on the train (killed him). After he was put on the train on the 9th (September 1981), on the 12th warrants for my arrest were issued." “We should be thankful to the Hind Samachar Group of Newspapers for two reasons. Firstly, it has initiated a fund for helping victims of terrorists and that of natural calamities and , secondly, for standing up against terrorism at a time when no other paper dared to do so. The family had not only lost two of its members — Lala Jagat Narain and Ramesh Chander Ji — but the newspaper lost 62 of its agents, hawkers, sub-editors and senior-sub editors. It is a remarkable contribution toward the country and in the interest of freedom of expression”. The White Paper issued by the government of India, mentioned that Lala was murdered because of his criticism of murders of Nirankaris in Amritsar. He was present during the clash that occurred between Nirankaris and Akhand Kirtni Jatha Members, and stood witness at the Karnal Trial, in favour of the accused Thirteen Sikhs and Two Nirankaris were killed in the clash. The Nirankaris fired from their guns and were acquitted by court on grounds of self defence. He was shot dead on September 9, 1981, near Amaltas Motel on the national highway while returning to Jalandhar from Patiala. Both the Government and Surjeet Jalandhari, project the murder as the murder of a person deeply involved in criminal cases in Punjab. In 1981, Bhindranwale barricaded himself inside the fortified Gurudwara Gurdarshan Parkash at Mehta Chowk, but was persuaded to surrender on September 20, 1981. For 25 days, violence exploded all over Punjab, while Bhindranwale was jailed in a Circuit House. India’s then Home Minister, Giani Zail Singh, announced to Parliament that there was no evidence that Bhindranwale was involved in Lala Jagat Narain’s murder, and was released in Oct. 15, 1981.